Today I found out how rum is made. Rum was once used as a medium of economic exchange in lieu of money. At one point in Europe, Rhode Island rum was even used as an accepted substitute for gold in economic exchanges. This drink, which first began being made as we know it today around the 17th century, quickly became one of the most popular alcoholic beverages in the world, before somewhat falling out of favor for a variety of reasons including legal restrictions on rum in the Caribbean. 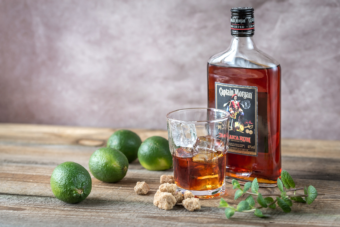 Although, rum has seen a huge upswing in popularity in the last decade, no doubt partly fueled by Hollywood, appearing in such films as the Pirates of the Caribbean series. The base ingredients for rum are generally molasses, yeast, and water. However, certain higher end rums, such as Zacapa premium rum, don’t use molasses. Rather, they substitute sugarcane juice, also known as “virgin sugar cane honey”, for the molasses. The use of sugar cane, whether in producing molasses or using the juice, in rum is largely what distinguishes it from many other types of liquors. Once the molasses is made or the juice has been pressed from the sugar cane and used directly, it is mixed with water and yeast. The yeast used for the fermentation step varies by distillery. Some will use “natural” fermentation where they allow the yeast from the environment to ferment the mixture. In this case, the vats are left open to the air to allow the yeast in the air access. On the other end of the spectrum, some distilleries are very careful to only use specific yeasts they add to the mixture. In either case, the fermentation stage typically takes between a few hours to a few weeks, depending on the method and types of yeasts used. Typically, the “natural” fermentation method will take the longest. Next up is the distilling process. Here the now fermented liquid is placed in a still. With rum, this is usually done with a column still, though sometimes it is done with a pot still. With whatever type of still is used, the fermented liquid is heated to somewhere in the vicinity of 175 degrees Fahrenheit, which causes the alcohol to evaporate. The vapor from the still is then collected and re-condensed. At this point the condensed vapor will typically be between 40% and 98% alcohol, depending on the still and other such factors, and can be bottled and sold as rum, if the manufacturer doesn’t choose to process it any further. Most major manufacturers, particularly those producing higher end rums, will instead choose to age the rum first. Typical minimum aging, if aging is going to be done at all, will be around one year. However, in the higher end rums, it isn’t uncommon for those rum makers to have batches aged for decades. During the aging process, the type of container the rum is stored in has a dramatic effect on the resulting color and flavor. For instance, when stored in stainless steel tanks, the rum will stay almost clear. When stored in oak casks, the rum will become very dark. Once the rum is aged the appropriate amount of time, it may be bottled and sold as is, or, more commonly, it will be mixed with other rums aged for a different time period and possibly the new mixture will be aged again. The final product will also commonly be filtered to adjust the color or, if the rum maker wants a darker color, caramel will typically be added. Water may also be added to adjust the strength of the rum. At this point, the rum is ready to be bottled and sold. Rum helped spur on the American Revolution as well as the Australian Rum Rebellion. It is estimated that around 3 gallons of rum were consumed per person per year in the American colonies shortly before the American Revolution. Rum production was also colonial New England’s largest industry. The passing of the Sugar Act in 1764, also known as the American Revenue Act, drastically disrupted the economy of many of the American colonies. Among other things, this act resulted in the colonies having to increase the price on their rum, which allowed the British West Indies to increase their market share of the sale of rum. This act, along with the later Stamp Act, enraged some of the colonists and helped establish the “no taxation without representation” that eventually became a rallying cry for the revolutionists. In the early years of the United States, the amount of rum a candidate gave away also significantly influenced the candidate’s ability to become elected. Generally, whichever candidate was giving away more rum, the crowds would gather to that candidates stump, which would ultimately significantly increase the number of votes that candidate would receive. George Washington insisted on a barrel of Barbados rum being available at his 1789 inauguration. Grog is traditionally a mixture of rum with water, although today the term “grog” is often used to refer to any alcoholic beverage. The origin of grog goes all the way back to British sailors a few centuries ago. Freshwater aboard sailing ships tended to become slimy with algae and other microbes growing in it. This made the water quite unpalatable. To get around this, ships began carrying beer and wine to mix with the water to improve the taste. However, this proved to be impractical on long voyages as it took a significant amount of beer and wine mixed with the water to noticeably improve the flavor. Around the 17th and 18th centuries then it became common to replace beer and wine with rum, which is much stronger. By 1756, it became standard practice to mix one pint of rum and two quarts of water as a sailor’s standard water ration, as officially decreed by the Royal Navy. They would also sometimes add lime or lemon juice to the mix. Drinking this mixture seemed to improve the health of the sailors, though, at the time, they didn’t know it was because of the Vitamin C.
The name “grog” is thought to come from Admiral Vernon of the British navy, who had the nickname “Old Grog”, due to the grogram cloak he wore. Sugarcane was originally brought to the Caribbean by Christopher Columbus. It is thought that the first rum, as we think of it today, was made around two centuries later in the Caribbean on the island of Barbados. Zacapa is a city in Guatemala which lent its name to the award winning premium rum. Zacapa, the city, is also known for their cigars and cheese. Light Rum: generally used in cocktails. This type of rum is not aged long and is something akin to Vodka, except with a slightly sweet taste. Amber Rum: often used in darker cocktails or sometimes drunk by itself. This type of rum is usually created by aging the rum in oak casks. It has a “smoother” flavor than Light Rum. Dark Rum: This type of rum is often drunk by itself, though can be mixed to make various cocktails. It is generally aged longer than Amber rum in oak casks, which gives it a very strong flavor and makes it the rum of choice for cooking. The color of this rum is generally dark brown, black, or red. Flavored Rum: This type of rum has a variety of spices or other flavor agents added during the distillation. One of the more popular varieties of this is coconut rum. Overproof Rum: This type of rum can reach as high as 80%-90% alcohol and is often used in cocktails. Well written, very informative and enlightening. Thanks for helping to spread the word about the renaissance of rum and the product that’s largely driving the new golden age of rum, Zacapa from Guatemala. Rum is fun. Pass the word. LOVAPAREEK, don’t you understand that all caps in a post is rude? It’s equivalent to the speech of a loud drunken boor. Yes, while meant to be more noticeable, thereby assuring that it is unmissed, it is interpreted as “shouting”, which of course is considered rude and unappreciated.